Place the butter and chocolate in a thin-sided bowl and suspend over the gently simmering bain-marie, ensuring that the bowl does not touch the water. Melt the chocolate and stir until smooth. Using the whisk on a hand mixer, beat together the eggs, icing sugar and salt until the mixture becomes lighter in colour. Stir in the chocolate. 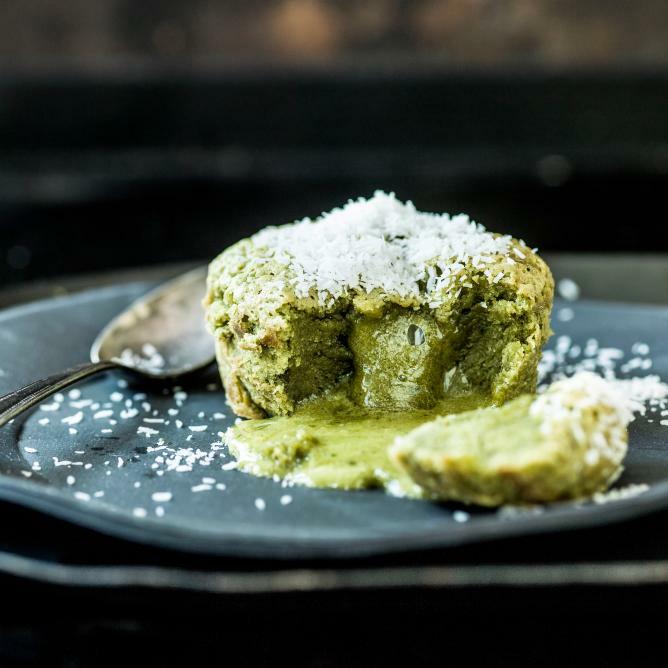 Combine the flour and matcha powder, briefly mix in. Divide the cake mixture into the prepared ramekins. Approx. 14 mins. in the centre of an oven preheated to 170°C (convection). The cakes should still be a little runny inside. Remove from the oven, tip the hot cakes out onto plates, sprinkle with coconut flakes, serve immediately.